Nap Clark Bible Conference Coming Up! Just wanted to give you a brief update on a couple of our GO TEAM MISSIONS this past summer! June 24th – July 2nd a great team from Immanuel Community Church in Fort Collins, Colorado (plus my wife Vicki and my daughter Heather) partnered with Emmanuel & Associates to work with Exmouth Baptist Church, Exmouth, Devonshire, England to reach out into their community to engage people with the the Good News that you will live forever, if you put your trust in Jesus. The team first distributed Gospels of John through home letter boxes and then followed up by going back to try to win souls for Christ. Some of our GO TEAM members were discouraged that people in Exmouth where a bit stand offish but we did see some encouragement from the mission outreach. We used the Costa Coffee shop in the town center to invite the community to a free coffee and a piece of cake. That evening we had music by my wife Vicki and my daughter Heather and a good crowd of people turned up for the event. I gave my testimony and the other team members mingled with our guests. We had some great opportunities to tell people that God loved them and Jesus died and rose again for them and they could live forever if they put their trust in Him! Pastor Mike Martin had a great conversation with a homeless man who made a profession of faith in Christ that evening! Pastor Mike has seen the Lord double the numbers of church attenders on Sunday and has started a ministry to children and teens and a cafe in the church building to reach out to people in the town center. Some of the church members were challenged by the witness of the team and they have committed to regular evangelism in the town as a result of GO TEAM partnership. Please pray for the healthy growth of this fellowship of believers in Exmouth Baptist Church! July 2nd – 9th a veteran GO TEAM from two churches in Birmingham, Alabama (Southcrest Baptist & Grace Community Church) partnered with Emmanuel & Associates (E&A) to minister the Gospel with the Garden City Alliance Church in Welwyn Garden City and Stevenage which are just north of London, England. Many of the people in these communities commute to the London area to work. This year was the third year that E&A GO TEAMS have partnered with Garden City Alliance Church to engage their communities with the Gospel. We held an outreach in the Costa Coffee shop, visited people in their homes, distributed Gospels of John through letter boxes and had a BBQ that church members invited their family, friends and neighbors to join us. The couple that hosted the BBQ had contacts and relatives that belonged to the Traveler Community (Gypsies). We had some great opportunities to challenge people with the Gospel at this event. Pastor Dave Turpin is an old friend and colleague who worked with me as an assistant pastor in London for eight years. Dave and his wife Linda and their son Andrew and his wife Chloe have been involved in church planting in both Welwyn Garden City and Stevenage for a few years now. Most of the people who are now church members are people who have been recently saved or were backslidden Christians who have repented and come back into fellowship with Jesus. I was very encouraged by the spiritual growth of members of the congregation that I witnessed over the past three years. The Garden City Church is small in number but to see many of the young men growing in their faith and commitment to Lord and to their young families and the church was also very encouraging! Thanks for taking the time to read this ministry report! I am beginning to organize GO TEAMS for 2018 and if you and others that you know would be interested in joining us next year, we would be happy to talk through how you can be a part of our GO TEAM ministry to the United Kingdom next year. Also please continue to pray for us as we seek to win souls, make disciple making disciples and multiply the church! Finally if you would like to support Emmanuel & Associates financially, please send your gifts to our address below! Thanks again for praying, going and giving to the work of the Gospel in the United Kingdom! GO TEAM MISSION partnership between Emmanuel & Associates International and Kelty Evangelical Church, Kelty Scotland and Good Shepherd Community Church, Boring, Oregon. For the last few years we have had an outreach to the community of Kelty with a food and fun event in a local rented hall. The idea was to help the church to connect with the community that the Lord had called them to serve and to present the gospel at this event. The last couple of years we have been able to rent the new Community Centre in Kelty. Last Easter the church rented the Kelty Community Centre and approximately 400 people from the community attended. VICKI DOING WHAT SHE LOVES TO DO! John Langlands and Hank John leading the singing at the Kelty retirement home. The older folks there really enjoy the GO TEAMS annual visit and always ask for Hank and John to demonstrate the chorus from the song “Jumping and leaping and praising God!” Praise God that a couple months after the team returned to the USA a lady from the retirement home started reading her Bible and made an open profession of faith and asked for believer‘s baptism! God has greatly used John and Margaret Langlands and Hank and Christine John in helping to revitalize the work of the gospel in Kelty through the fellowship at Kelty Evangelical Church! On our team day off we found it hard to resist playing a round of golf on the oldest golf course in the world! This is a picture of my friend Scott Stuart and me on the 17th tee (“The Road Hole”) at the Old Course in Saint Andrews, Scotland. We had a great time playing golf that day! We were also able to tell the other two golfers that made up our four ball and their caddies how they could know for sure that they would go to heaven when they die! Please continue to lift us up in prayer as we plan for next year. I will be traveling to the U.K. on October 23rd – November 17th to work with our church partners for the 2018 GO TEAM MISSIONS. Please pray for us to win souls, to make disciple–making disciples and to multiply the church. Thanks for taking the time to read this ministry report on our 2017 GO TEAM MISSION KELTY Mission and for your prayers that are powerful and mighty in helping to bring down the strong holds that our enemy has over the hearts and minds of the people in the United Kingdom. Thank you again for supporting us with your prayers and with your finances and in joining us on a GO TEAM MISSION in the United Kingdom! Now it’s time for the harvest, right? Praise God – throughout the many mission opportunities that we had over the last several months, we can say that we have already had a harvest. New people coming to faith in Christ. Grandmothers, children, men, teenagers. God has blessed His Word going out. Why should we be surprised when He blesses His Word? He told us that He would! Isaiah (in 55:11) talked about the times when the Bible is preached, taught or shared, and reminded us that it will not return void. There WILL be fruit. Praise God for calling us to such a great task, and for giving us encouragement in it. Be encouraged in the work that God has called you to, today. He Who has called you, has also equipped you to do that work. We are praying for more fruit, where we live, work and play. We’ve had a blessed year. Lots of travel, some sickness, much blessing – We (Wyatt & Vicki) were able to travel together in ministry for the first time in several years, and we hope it will happen more and more in the future! We met in ministry, and think we work really well together! Christmas will be here soon. Let’s remember to be intentional this year. To use this time of year to love and give and share the love of Christ with others. May we not just cruise through the traditions and forget to be PERSONAL! My favorite movie quote is, “Whatever else it is, it should START by being PERSONAL!” Loving people and choosing not to be mediocre is an exciting way to live. It will stretch me beyond where I am comfortable and I will have to trust God. And that’s always a good thing. Praying for you all an intentional, meaningful Christmas, with Christ at the center! If you would like to donate to this ministry, please go to http://www.emmanuelandassociates.org and click on the donate button to give electronically. May the Lord bless you and yours! Merry Christmas! 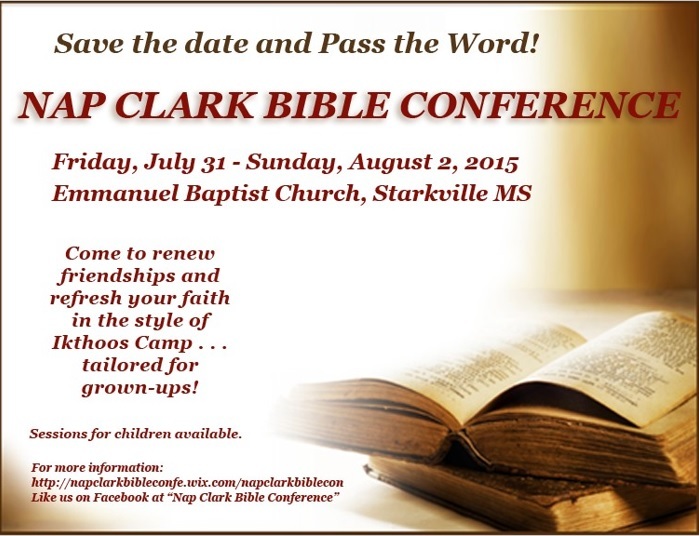 This conference is dedicated to the ministry of Nap Clark, who is now present with the Lord. Nap was my first pastor and mentor, as a new Christian. He taught us to be faithful to the Word, to witness, and to serve. The Title of this Conference is “Keep the Faith”. Come and enjoy a refreshing time of fellowship and revitalization. Please pass this on to people in your sphere of influence! Here’s an Outreach Church with a Vision! 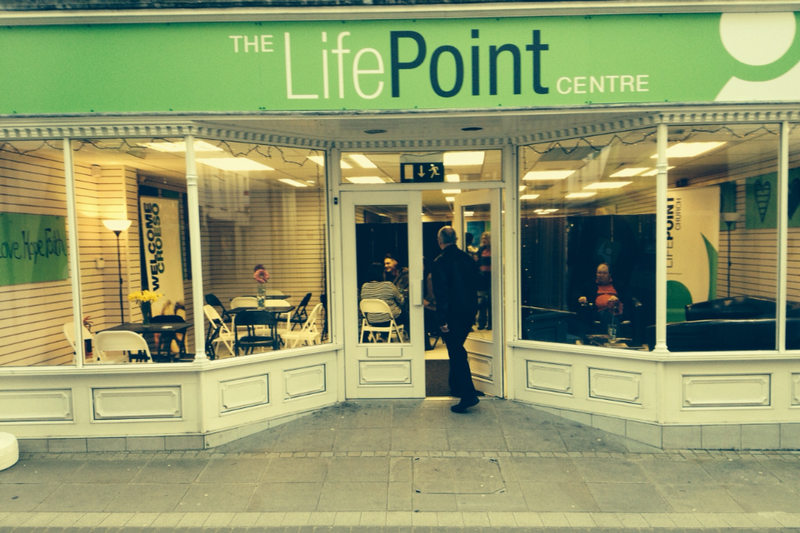 Life Point Church at Life Point Centre in a SHOP in the town centre of Haverford West, in South West Wales. If you’re in the area, check out what God is doing there. The Lord opens doors of opportunity as we all pray. Because He can. And because maybe we are looking for them more when we pray! 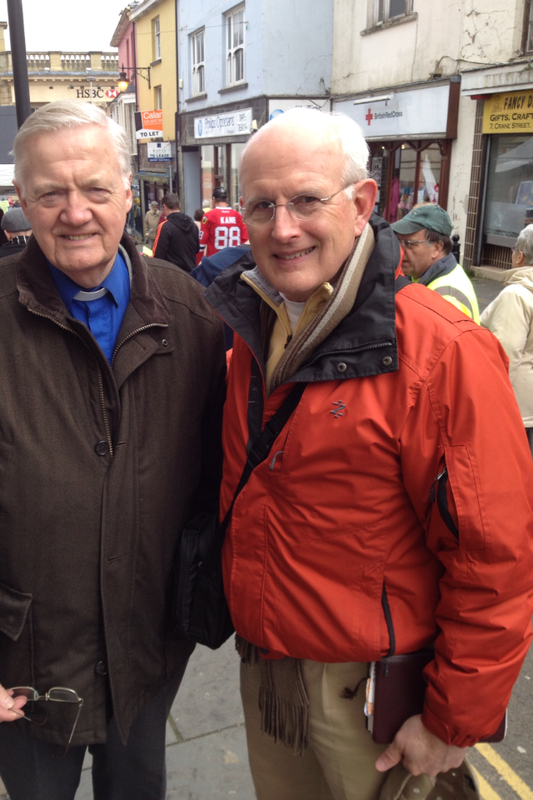 Here I am with Richard Harrison, a long time friend, in Pontypool, Wales. Great time preaching in the open air together! !